"…a useful reference for all researchers or students of parasitology." 1. Morphology of the Amphistomes 2. Designation and Scope of Amphistomes 3. Techniques for Studies of Adult Amphistomes 4. General Appearance of the Amphistomes 5. Body Shape and Size 6. Body Surface 7. Tegumental Papillae 8. Organ Systems 9. Digestive System 10. Reproductive System 11. Male Genital Organs 12. Female Genital Organs 13. Excretory System 14. Lymphatic System 15. Nervous System 16. Histo-Morphology of the Muscular Organs 17. Pharynx and Keys to Their Types 18. Types of the Pharynx with Two Intramural Primary Pharyngeal Sacs 19. Types of the Pharynx with Two Extramural Primary Pharyngeal Sacs 21. Type of the Pharynx with Unpaired Primary Pharyngeal Sac 22. Types of the Pharynx with Pharyngeal Bulb and Secondary Pharyngeal Sacs 23. Types of Pharynx without Pharyngeal Bulb and Secondary Pharyngeal Sacs 24. Terminal Genitalium and Keys to Their Types 25. Types of the Terminal Genitalium with True Or Modified Cirrus-Sac 26. Types of the Terminal Genitalium with Hermaphroditic Pouch 27. Types of the Terminal Genitalium without Cirrus-Sac and Hermaphroditic Pouch and with Tegumental Papillae 28. Types of the Terminal Genitalium without Cirrus-Sac, Hermaphroditic Pouch and Tegumental Papillae 29. Acetabulum and Keys to Their Types 30. Acetabulum of the Group I 31. Types of the Acetabulum of Group I 32. Acetabulum of the Group II 33. Types of the Acetabulum of Group II 34. Acetabulum of the Group III 35. Types of the Acetabulum of the Group III 36. Ecology of the Amphistomes 37. Life-History Pattern 38. Pre-Parasitic Stage 39. Intramolluscan Larval Stage 40. Sporocyst 41. Redia 42. Cercaria, Adolescaria 43. Life-Cycle in the Definitive Hosts 44. Intermediate Snail Hosts and Intermediate Host-Specificity 45. Scope of the Definitive Hosts and the Host-Specificity 46. Effects of the Worm-Burden on Definitive Hosts 47. Systematics of the Amphistomes 48. History of the Classification 49. Order Amphistomida 50. Heronimata 51. Zonocotylata 52. Paramphistomata 53. Cladorchoidea 54. Cladorchiidae 55. Diplodiscidae 56. Gastrodiscidae 57. Balanorchiidae 58. Brumptiidae 59. Paramphistomoidea 60. Zygocotylidae 61. Gastrothylacidae 62. Paramphistomidae 63. Orthocoeliinae 64. Paramphistominae 65. Phylogenetic Relationships Among Amphistomes 66. 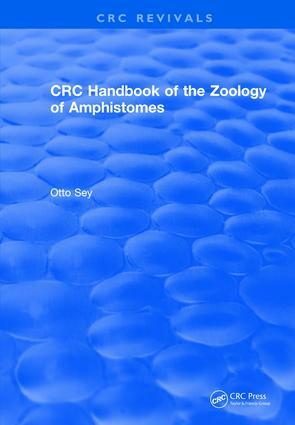 Zoogeography of the Amphistomes 67. General Accounts 68. Co-Evolutionary Relationships 69. Distribution and Characterization of Amphistomes by Zoogeographical Realism 70. Palaearctic Realm 71. Nearctic Realm 72. Neotropical Realm 73. Africotropical Realm 74. Indomalyan Realm 75. Australian and Oceanic Realms 76. Dynamic Zoogeography of the Amphistomes 77. Evolution of Amphistomes 78. References.